Have you ever noticed that you rarely see a lone ant? That’s because they travel in colonies. When one little scavenger picks up the scent of food, he carries it back to his nest. Soon the whole family lines up and follows the leader. Before you know it, they’ve made themselves at home in your kitchen or on your outdoor buffet. 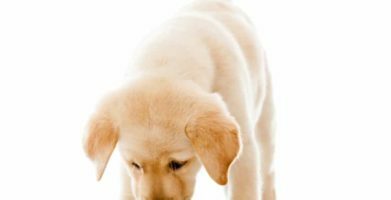 The good news is, there are ways to throw off their little scent detectors and keep them away from your home. And many of them are as close as your kitchen cupboard. 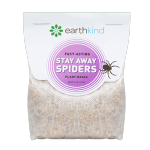 Here are seven simple solutions that are part of EarthKind®’s #AntBites series. And there’s more where these came from. 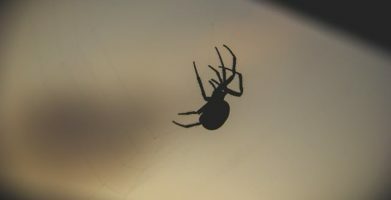 Be sure to follow our Facebook & Pinterest pages, where each month we offer you quick tips on how to keep ants, spiders, rodents and moths out of your home. We’re not talking about your crazy Aunt Louise. There really is a species called the Crazy Ant. Just ask anyone who lives in the South. They’re much harder to control than their Northern counterparts. They wander aimlessly on walls and countertops and they can wreak havoc on laptops and TV equipment. 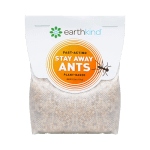 Be sure to seal up any entries you find and put a pouch of Stay Away® Ants near any electronics. Cookies, crackers, casseroles. Ants aren’t that particular. We’d suggest limiting all your cooking and consumption to just a couple easy to clean areas. Ants will be less likely to invade if they can’t find crumbs or spills. Piles of lumber or leaves, as well as stacks of rocks or mulch, all look like dream homes from an ant’s perspective. Keep them far away from your home or ants will find their way to your front door. A leaky faucet or pipe provides the perfect passageway for ants. They’re drawn towards moisture and an unrepaired opening is like putting out a welcome mat in your house. Fix any drips and ants will be looking for a more inviting dwelling. 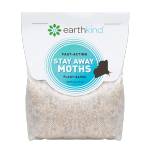 While ants think the cracks in cement are cozy, they’ll make their home in someone else’s driveway or patio, if you sprinkle diatomaceous earth on yours. Their tiny bodies find the substance irritating and they’ll quickly find a smoother path. If a worker ant stumbles upon a great source of food, it will leave a trail of scent, so that the rest of the colony can chow down too. If you can’t bear to kill the tiny creatures, quickly clean the area with vinegar. Then slip outside and spill a little sugar. They’ll think they hit the jackpot and stick to the selections served outside. 7) Have Ants Created A Nest Outside Your Home? Try A Sprinkle Of A Strong Herb Or Spice. Every colony of ants has its own smell and they can detect an intruder in an instant. If you sprinkle a strongly scented herb or spice around the entrance to their nest, the ants will sense danger and the entire colony will promptly find a new home. If you’re looking for a long-lasting natural solution, we’re proud to say that our newest product for the home, Stay Away®, which repels rodents, ants, spiders and moths, and is made solely from essential oils and plant fibers, has been selected as one of the best new products of the year by the producers of the Natural Product Expo. Just place a pouch of Stay Away in problem areas and uninvited guests will be finding their way to a more welcoming home. Have you ever noticed that you rarely see a lone ant? That’s because they travel in colonies. When one little scavenger picks up the scent of food, he carries it back to his nest. Soon the whole family lines up and follows the leader. Before you know it, they’ve made themselves at home in your kitchen or on your outdoor buffet. Cookies, crackers, casseroles. Ants aren’t that particular. We’d suggest limiting all your cooking and consumption to just a couple easy to clean areas. Ants will be less likely to invade if they can’t find crumbs or spills. If a worker ant stumbles upon a great source of food, it will leave a trail of scent, so that the rest of the colony can chow down too. If you can’t bear to kill the tiny creatures, quickly clean the area with vinegar. Then slip outside and spill a little sugar. They’ll think they hit the jackpot and stick to the selections served outside. string(51) "7 Simple Solutions To Keep Ants Away From Your Home"